A Mormon (the nickname sometimes given to members of The Church of Jesus Christ of Latter-day Saints) has created a new website to help prospective missionaries prepare to serve in locations unfamiliar to them. This is not an official site for the Church, but the project of an individual. Mormons who decide to serve a mission agree to go wherever they are needed. This means they are usually sent someplace very different from where they grew up, since one purpose of a mission is to broaden the young person’s horizons. A Utah young adult will get sent to the very diverse Philadelphia. A Philadelphian will find himself in Utah. A rich missionary will find himself in a developing nation. The site’s founder, Brigham Young University student Alex Balinski, was sent to Argentina. He wished he could find a resource that would help him understand the culture before he went. Even two years in Argentina mingling with the native people and speaking the language caused him to realize there was still much he did not understand about the country. While preparing projects for his broadcast journalism classes after his mission, he began conceiving the idea of a website that would help prospective missionaries learn about the cultures of the places they will be serving in and where former missionaries could provide first-hand information on how to best prepare for a mission. The recent lowered ages for both male and female missionaries made the project even more essential. Missionaries will be serving at younger ages and will need to be better prepared to leave home and spend two demanding and maturing years serving God. He recruited other students at BYU to help him search YouTube for ready-made videos that could be placed on the site to get it started quickly. Eventually he hopes to have country-specific information, a forum where prospective missionaries can ask questions of returned missionaries or collect information from people with experience and knowledge about a location or an aspect of missionary service. The site will also link to missionary blogs and to other resources. The website, Prepare to Serve, is volunteer-run and accepts donations to cover the costs. People can also volunteer to help provide location information or missionary advice. Mormon men may serve a two-year mission at age eighteen if they have completed high school or the equivalent. 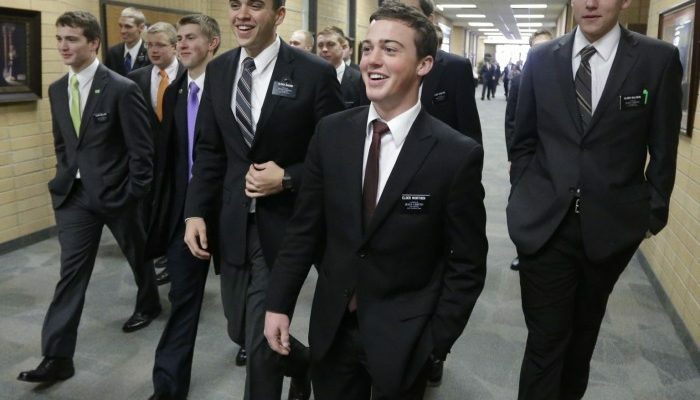 Missionary work is primarily a priesthood responsibility and young men are expected (but not required) to serve. (Mormons have a lay priesthood for all worthy men) but women are welcome in the mission field and are often welcomed into homes that turn away men. Women serve for eighteen months beginning at age nineteen. Since the lowering of the ages, the percentage of applications from women has risen dramatically to just less than half of all applications. Unmarried Mormon men can serve only until age 26, but unmarried women may serve at any age. Retired couples may also serve missions together. Mormons serve missions at their own expense and most save money from childhood for the experience. The strict discipline, the exposure to new cultures, and the intense focus on serving God helps missionaries mature more quickly than many of their peers and also prepares them for successful careers and family life. They often develop a firm testimony of the gospel during that time of service and establish a habit of lifelong service to others.